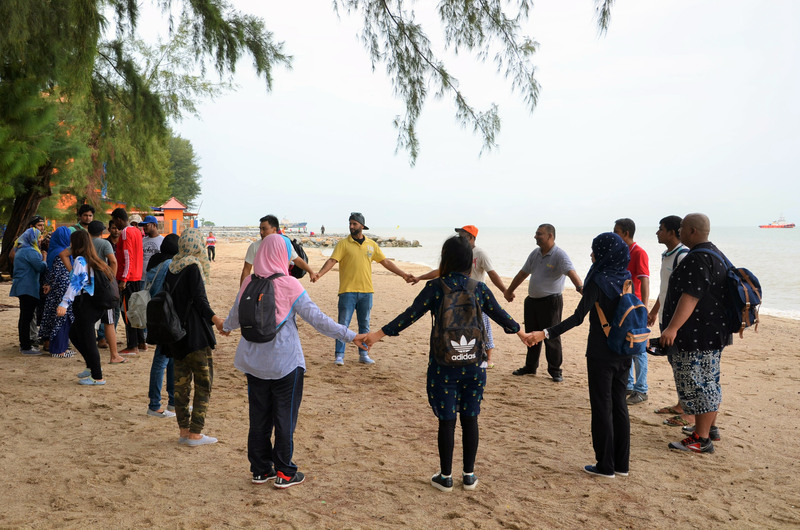 AUGUST 2017– As part of the requirements for their Human Resource Management course (HRMT 5310), a group of Master of Business Administration (MBA) students together with few a Ph.D students and other environment enthusiasts from Infrastructure University Kuala Lumpur (IUKL) organized a Corporate Social Responsibility (CSR) activity at Pantai Puteri, Melaka. The activity conducted under the theme “IUKL to help with Coastal Cleaning” was aimed at improving the sustainability of marine life. The group departed from IUKL to Melaka on a rainy, Saturday 12th of August at 7 am and reached Pantai Puteri by 9.30 am. Then the students and Professor wearing protective rubber gloves, teamed up and started clearing parts of the Pantai Puteri coastline. Polluting materials such as empty bottles, plastic bags, polystyrene and other man-made pollutants were collected and disposed of. The CSR committee consisted of 12 MBA students and their advisor, Prof. Dr. Noor Saadah Zainal Abidin. The group’s contribution was appreciated by the locals, businessmen, and picnickers. The main objective behind the activity was to expose students to CSR activities and get ‘hands-on’ experience on how university students can help to ‘give back’ or contribute to the community around them as well as improve the lives of others. In the afternoon, they participated in a series of team building exercise in the form of mini educational games by which students get to bond. By the time the clock struck 4.00 pm, the group had managed to complete both the targeted CSR activity, team building exercises and embarked on their journey back to the university with smiles on their faces and gratitude in their hearts. All in all, the CSR Committee’s trip to Pantai Puteri with the MBA students was a grand accomplishment for all the members.